While Philadelphia is my base, I’m in Sydney once a year for a stint. Every year, there seems to be something new with my Google search results that piques my interest. This year seems to have been particularly confusing for my Google searches. At times, I haven’t been able to perform searches via google.com. It wouldn’t redirect me to google.com.au like it used to either even though I had physically set my location for Sydney. A technical glitch that may have more to do with my computer than Google. So this year in addition to these quirks, my search results really struggled with my location. An example of this inner turmoil is represented in the following screenshot. 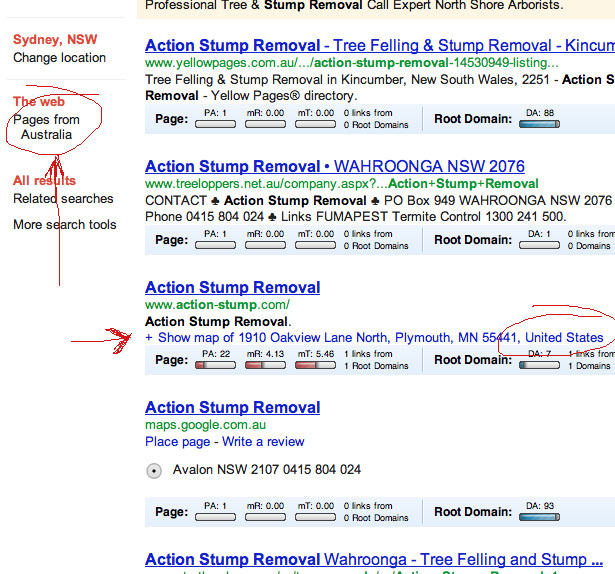 On a search for my mates business Action Stump Removal, such a localized search I imagined would yield strictly local results. However, you will notice that one of the results slipped in is from Minnesota, a place I’ve been twice many, many years ago. I’m not overly sure how to explain this other than my inner turmoil theory where Google sees my search history as being predominately US-based but knows my current location is Sydney. This stray result has a decent domain keyword match though the website is no shining example with indications that it was last “Revised Wed, 23 May 2007”, a domain authority of 7/100 and a grand total of 2 incoming links according to Majestic SEO. So my hunch here is that Google might be struggling between prioritizing between personalized search and location in trying to deliver most accurate results. So sure enough, the results are only within Australia but they cover all of Australia. 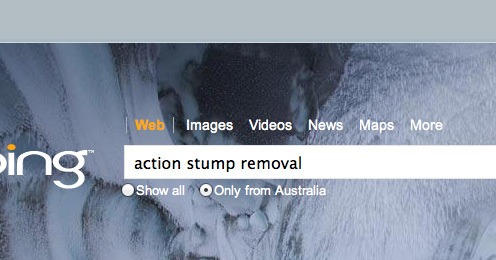 The first result is from Sydney, the second Queensland and the third Victoria. Not overly helpful I’m afraid. So even with their confusions, Google still gets closer to a better user experience and result. I have a feeling these quirks are more an exception than the rule. Could SEO Have Saved Borders?